Once a year the Franschoek Literary Festival brings heap of authors, local and international, not to mention all their fans to sunny South Africa. This year one of the authors to spend a week in Franschoek was the renowned and very popular in our household, Chris Bradford. Chris Bradford is the author of the very well read and loved Young Samurai Series, as well as The Bodyguard Series. We have met Chris Bradford before when he was here in 2013… and we were exited to be offered an interview with him. Do you have a typical working day? Are you a disciplined writer that works to a strict schedule or do you write furiously when the inspiration grabs you? Being a professional author means having to write whether the inspiration grabs you or not. So my typical writing day starts at 8am and finishes at 6pm. In that time my goal is to write one chapter – about 1000-1500 words. It begins with a lot of thought about where the chapter is heading, what it has to do to progress the book and how to end it on a cliffhanger. This might lead to research on a location or particular martial arts technique or a new character. Then it is a mental battle with myself to write the words and produce a decent chapter at the end of the day! Sometimes it flows, sometimes it doesn’t, but whatever I have to have a chapter written. As a child where you a big reader or did someone consistently read to you? Do you have a favourite childhood book? I was a voracious reader as a child (and still am!). I loved the Willard Price books like Safari Adventure and Lion Adventure, as well as the Fighting Fantasy series by Ian Livingstone and Steve Jackson. But my favourite has to be The Twits by Roald Dahl. What sort of books do you enjoy reading as an adult? What book are you reading right now? I am a massive fan of Stephen King. I’m currently reading his Shining sequel, Doctor Sleep. When I first decided to write fiction, I devoured his book ‘On Writing’ – it’s a masterclass in the art of fiction writing and I recommend it to any aspiring author. When you were a child what did you want to do when you grew up? Did you always know you would be a writer or did that idea grow with you? The truth be told, I wanted to be a rock star! And for thirteen years of my life I pursued that dream – once even performing for the Queen of England. However, through my music career I got a chance to write a book on songwriting (Heart & Soul: The Craft of Songwriting) and that launched my career as an author. Following that, my passions for martial arts led me to write children’s fiction when I came up with the idea for Young Samurai. Tell us something about how you prepare to write a book? We know you like to climb into your characters… what does that involve? I practise something I term ‘Method Writing’. I really immerse myself in the life and skills of my characters. So for my Young Samurai series I trained in samurai swordsmanship and the art of the ninja. And for my Bodyguard series, I trained and qualified as a professional bodyguard. This enables me to write very authentic and action packed novels. 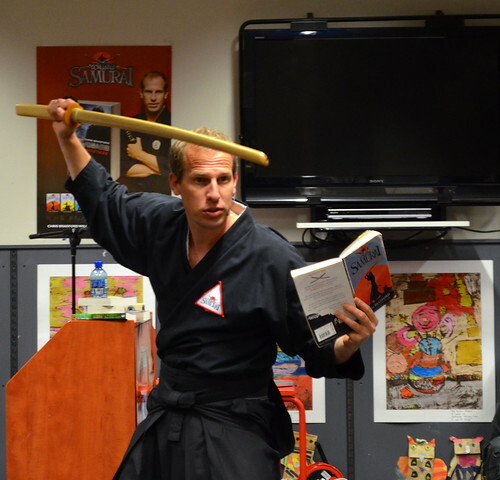 Furthermore, it allows me to create very dynamic and involving events around my books where I can demonstrate martial arts techniques and teach readers crucial bodyguard skills – just like the heroes and heroines of my books. Your books are always part of a gripping series. When you begin writing do you have the big picture of the whole series in your head or does the story begin and you get carried along by the characters? I know I have a good idea for a book when I can picture the entire series in my head. For Young Samurai, I knew the ending of the third book and the eighth. And for my Bodyguard series, the idea was spawned by a single line on the radio: “The best bodyguard is the one nobody notices.” In that moment, I could see the plot arc for the six books and began writing down the basic premises of each in that first hour of creativity. You have traveled the world researching your books, what is your favourite food from anywhere in the world? I love all food. In England I love steak and chips. In Japan, sushi is my favourite. And in South Africa, I love springbok! What would you advise your young readers, who might want to write exciting books of their own one day. And always start with an exciting scene. Go straight into the action like my books always do! 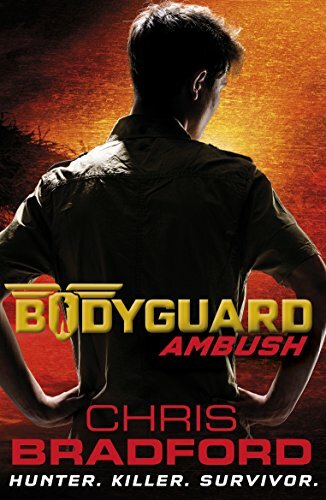 Bodyguard: Ambush by Chris Bradford and published by Penguin Random House South Africa. Have to say my guys love a gripping book set in Africa, and the third in the Bodyguard Series is as exciting as ever. The hero of the series, Connor, needs a break from the hectic events in his life, so he is assigned to a family heading for an African Safari vacation. Little does he know that they are walking into a civil war and suddenly in the middle of a military coup and somewhat of a crisis. This book raises a couple of interesting issues: boy soldiers, so prevalent in Africa, a wheel chair bound bodyguard, not so prevalent anywhere. Of course there is more to Africa than civil war and while Connor is protecting the kids of the family he was trying to protect, he has to cope with the wilds of the African plains. There are a couple of survival tips thrown in for good measure. If you are ever hungry for a couple bugs then you will be well equipped. The book is a fast paced, action packed, racing onwards, despite all the odds and above all trust nobody kind of a book. This book also has some cool fact-type pages at the back – how to survive in the wilds, how to survive an attack from a wild predator – like a crocodile or a hippo attack… Fundamentally useful facts to store away in your mind should you ever require them. A great read, just what you would expect from Chris Bradford. You can look for reviews of the previous books in the series at these links: Book 1: Hostage and Book 2: Ransom. Thank-you so much to Chris Bradford for your fantastic interview, and thank you to Penguin Random House South Africa for organising it for us. We received a copy of Bodyguard Ambushed for review purposes, and opinions are as always our own. Rockstar to writer – I can’t even imagine that. But I love that he immerses himself in whatever book he is writing, which I’m sure gives him a first hand experience. I know Mrs FF, isn’t it interesting. I really enjoyed this interview 0 this a lot very cool inspiration and factoids hidden in those answers!!! Thanks so much for stopping by!!! I enjoyed reading the interview. The book is a great read for all, I’m sure, but more so for my guys. Hi Nita, So glad you enjoyed the interview… I am sure your guys enjoy his writing, my kids love his fast paced books. Hope you have a great week!!! Had read Chris Bradford’s Young Samurai series sometime ago, but rediscovered him and his Bodyguard series now. Fell in love with the stories. The interview here is a beautiful insight into the writer’s mind. Thank you! So glad you enjoyed it Anu, my kids have enjoyed his books again and again and again!!! Thanks so much for stopping by!! !